Auxiliary Force Sdn. Bhd. 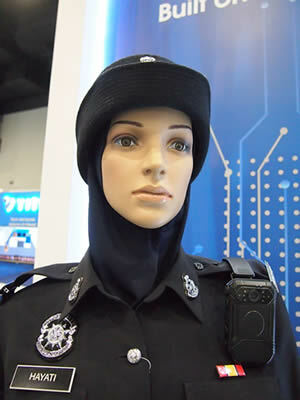 (AFSB), a member of Royal Malaysia Police Cooperative Bhd., is working with YITU Technology (YITU), a pioneer in Artificial Intelligence (AI) research and innovation, to transform and augment Malaysia’s public safety and law enforcement efforts. As YITU’s client in Malaysia, AFSB is the first security force in the country to integrate body-worn cameras with cutting-edge facial recognition technology. In line with efforts to enhance the way auxiliary police safeguard the community, infrastructure and assets, AFSB has tapped YITU’s facial recognition technology to allow officers to review captured video footage to positively identify persons of interest post-event. Implemented since February 2018, the body-worn cameras are currently in use by auxiliary police officers of AFSB at various critical infrastructure, with plans to increase the roll-out to more locations across Malaysia in the near future. YITU is working with its system integration partner in Malaysia, Build Technology Converge, to deploy the body-worn camera system. “AFSB is committed to bring constant innovation and forward thinking to the security landscape in Malaysia. This is a significant step forward for us as we leverage artificial intelligence to increase public safety and security.Looking ahead, AFSB also intends to expand the capabilities of our body-worn camera system to include real-time facial recognition and instant alerts to the presence of persons of interest from criminal watchlists,” commented Dato’ Rosmadi Bin Ghazali, CEO of Auxiliary Force Sdn. Bhd. YITU's facial recognition solutions are currently being used for security at Chinese tourist locations including ports, and public spaces which require high safety standards. "AFSB leads the way in introducing new security technologies to transform the security landscape in Malaysia,” said Lance Wang, YITU Technology’s General Manager of Southeast Asia, Hong Kong and Macau. “We are committed to supporting AFSB in their journey to strengthen public security and to become a leading player in the security industry. Our work with AFSB builds on our joint belief that AI technologies will help bring about safer and more secure communities in Malaysia," Wang added. YITU’s state-of-the-art algorithm won first place in the globally-renowned Face Recognition Vendor Test (FVRT) organised by the National Institute of Standards and Technology (NIST) in 2017. It also won the face identification accuracy segment of the Face Recognition Prize Challenge, hosted by the Intelligence Advanced Research Projects Activity (IARPA) in the United States.